During two intensive field campaigns in summer and autumn 2004 nitrogen (N2O, NO/NO2) and carbon (CO2, CH4) trace gas exchange between soil and the atmosphere was measured in a sessile oak (Quercus petraea (Matt.) Liebl.) forest in Hungary. The climate can be described as continental temperate. Fluxes were measured with a fully automatic measuring system allowing for high temporal resolution. Mean N2O emission rates were 1.5 µg N m−2 h−1 in summer and 3.4 µg N m−2 h−1 in autumn, respectively. Also mean NO emission rates were higher in autumn (8.4 µg N m−2 h−1) as compared to summer (6.0 µg N m−2 h−1). However, as NO2 deposition rates continuously exceeded NO emission rates (−9.7 µg N m−2 h−1 in summer and −18.3 µg N m−2 h−1 in autumn), the forest soil always acted as a net NO x sink. The mean value of CO2 fluxes showed only little seasonal differences between summer (81.1 mg C m−2 h−1) and autumn (74.2 mg C m−2 h−1) measurements, likewise CH4uptake (summer: −52.6 µg C m−2 h−1; autumn: −56.5 µg C m−2 h−1). 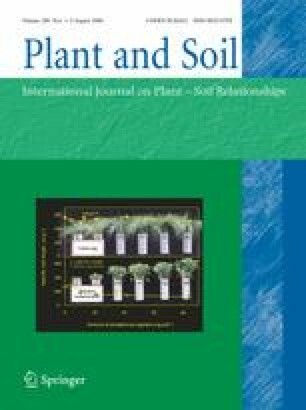 In addition, the microbial soil processes net/gross N mineralization, net/gross nitrification and heterotrophic soil respiration as well as inorganic soil nitrogen concentrations and N2O/CH4 soil air concentrations in different soil depths were determined. The respiratory quotient (ΔCO2 resp ΔO 2 resp −1 ) for the uppermost mineral soil, which is needed for the calculation of gross nitrification via the Barometric Process Separation (BaPS) technique, was 0.8978 ± 0.008. The mean value of gross nitrification rates showed only little seasonal differences between summer (0.99 µg N kg−1 SDW d−1) and autumn measurements (0.89 µg N kg−1 SDW d−1). Gross rates of N mineralization were highest in the organic layer (20.1–137.9 µg N kg−1 SDW d−1) and significantly lower in the uppermost mineral layer (1.3–2.9 µg N kg−1 SDW d−1). Only for the organic layer seasonality in gross N mineralization rates could be demonstrated, with highest mean values in autumn, most likely caused by fresh litter decomposition. Gross mineralization rates of the organic layer were positively correlated with N2O emissions and negatively correlated with CH4 uptake, whereas soil CO2 emissions were positively correlated with heterotrophic respiration in the uppermost mineral soil layer. The most important abiotic factor influencing C and N trace gas fluxes was soil moisture, while the influence of soil temperature on trace gas exchange rates was high only in autumn. The authors thank Rainer Gasche, Michael Dannenmann and Christian Werner for scientific advice and expert technical assistance. Furthermore, we thank Sönke Wienholdt and Philipp Haas for their perfect support during the field campaigns. The work was funded by the European Commission in the NOFRETETE project (EVK2-CT2001-00106) of the fifth framework program.